Permeable PaverPermeable pavers are the latest environmentally-friendly hardscape product from CST, provides sharp styling and optimum protection against storm water run-off, allowing for the readmission of water into the ground and the natural re-charge of the aquifer. 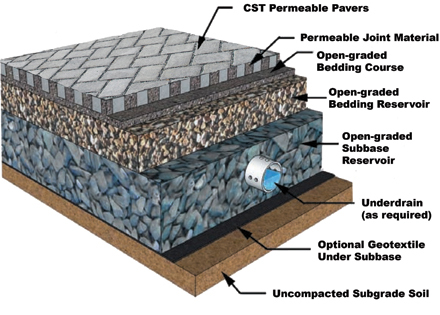 Plus, CST’s Permeable pavers help protect the environment from dangerous pollutants in storm water run-off. 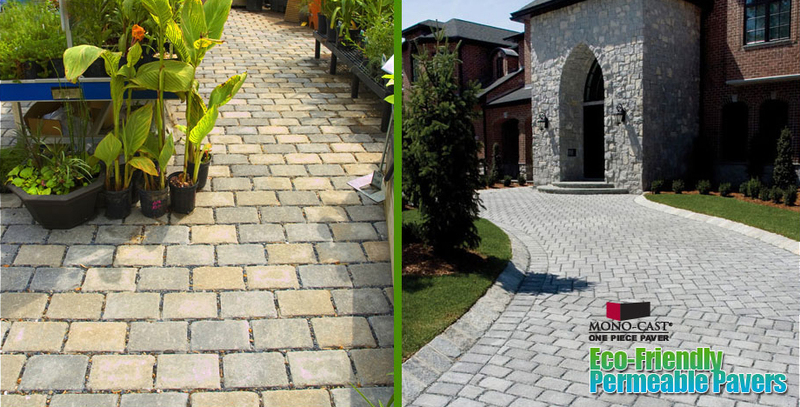 Permeable pavers, are the ideal solution for eco-friendly hardscape design and optimum aesthetic appeal. Why use a Permeable Paver? Federal, state, and local sustainable site regulations hope to reduce environmental impacts of increased runoff from roofs and pavements. Permeable Pavers reduce runoff and pollutants, recharges ground-water, and helps reduce downstream erosion and flooding. PICP comprises a layer of solid concrete pavers separated by joints filled with small stones. Water enters the joints between the pavers and into an “open-graded” base-crushed stone layer with no small or fine particles. The void spaces among the crushed stone store water and infiltrate it back into the soil subgrade. The stones in the joints provide permeability, and the base filters stormwater and helps reduce pollutants.